Growing up, fast food was a staple of mine. I kid you not, I ate McDonald’s almost every day. No fast food chain was off limits. KFC, Dairy Queen, Burger King, Taco Bell, Pizza Hut…this was my childhood. 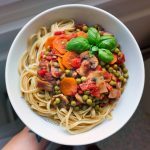 While my mom regularly prepared meals from scratch at home, we still ate out often simply because it was easier, or at least it seemed easier at the time. My father, on the other hand, obsessed with McDonald’s and fast food in general, pushed his unhealthy eating habits on me and my sisters. Besides his penchant for fast food, he’d feed us nothing but processed foods like Hamburger Helper, tinned ravioli, and cheese in a can. Looking back on all this now, it’s no surprise that my skin was in such a state. I suffered from terrible acne from the age of 15 or 16 until a few years ago. It wasn’t until I eliminated animal products, quit birth control, minimised the amount of fat I was consuming (even avoiding ‘good’ fats like nuts), and quit washing my face that my acne cleared up. Check out my post on my minimalist skincare routine for more information. When I moved away from home to live on my own, I continued to eat heavily processed foods and fast food with abandon simply because that was all I knew. Like my mother, I enjoyed cooking at home so I often prepared meals myself, though these meals were not vegan and tremendously fatty given all the animal products used. Reading the book Fast Food Nation by Eric Schlosser set me down the path to vegetarianism and later veganism. (Don’t bother watching the fictional movie with the same name.) This book not only delves into the deplorable conditions of slaughterhouses (for the animals and humans workers alike) but it also focuses on the processed nature of these so-called ‘foods.’ Before reading this book, I never really considered what took place inside a slaughterhouse, or the origin and ‘lifecycle’ of the beef patty, cheese slice, bacon, and fries found in my McDonald’s meal. This harrowing investigation of the American fast food industry shocked me into giving up meat for a few months. I was disgusted by the food industry as a whole and wanted to minimise the amount of processed and manufactured food I consumed. I quit eating fast food and started researching more about meat and dairy industries. I found quitting meat easy yet continued to eat cheese and eggs. I felt better for ‘giving up’ meat but didn’t experience any improvement with my health. (It’s strange to say ‘giving up’ because we can’t give up something that was never ours to take….) At the time I wasn’t interested in living a healthier lifestyle, I was only aimed to distance myself from the fast food industry. I was incredibly unhealthy and unhappy with the way my life was going at that time. I researched veganism online and felt like this was the next step for me. A few months later, at the start of 2008, I made the commitment to go vegan for health reasons. I wanted to lose weight, as well as clear my skin, and veganism was presented as a relatively easy way to do both. It wasn’t until almost a year later that I started learning about the ethical side of veganism. This is because I majored in philosophy at the University of Georgia. Environmental ethics interested me the most, and this class sealed the deal so to speak when it comes to my veganism. I learned the ethical and logical arguments for veganism, and that no matter how good meat tastes, we have no justifiable reason to cause suffering in animals just to satisfy out taste buds. During my studies, I also watched the documentary Earthlings for the first time. Veganism is a no-brainer for me. If we can acquire all the necessary nutrients we need from plant-based food sources, there’s absolutely no need to breed and slaughter billions of animals each year. In the US alone, over 9 BILLION animals are slaughtered every year. This number doesn’t include fish, crustaceans, or animals like rabbits and horses. Besides being used for food, animals suffer at the hands of humans and languish in circuses, zoos, aquariums, and puppy mills. They are subjected to brutal laboratory testing for no legitimate reason. We skin them alive for coats, purses, and designer shoes. Their purpose is simply to exist so we can use them. All of this is a gross disrespect of our planet. How dare we mistreat others in this way? We wouldn’t dream of inflicting these horrors on our worst enemies, yet we pay others to kill and torture animals every day based on the foods and products we purchase. We don’t even bat an eye. Ethics aside, my health is still the main reason why I’m vegan. While it is illogical to me to contribute to the suffering of animals when it is completely unnecessary, health is still my focus. At the end of the day, does it really matter why we go vegan? To me, it doesn’t matter. Ultimately, what matters is that we continue to abstain from using and consuming animal products. Animals are not resources, they are not ours to use as we like. We are just one species on this earth and we share this space with countless other creatures, big and small. Veganism is the only way to live that minimises the unnecessary suffering of animals and our detrimental impact on the environment. And at the same time, veganism (at least a whole foods based approach) happens to be the optimum diet for health. My health isn’t something to be compromised. I have one body and one life here so I want to live my life to the fullest. To me, this means following a lifestyle that makes me happy, healthy, and most of all a lifestyle that’s consistent with my ethics. I love animals and would never want to participate in or cause any suffering. I don’t want to purposely harm this planet and this environment we live in. I believe most systemic problems faced by humanity can be remedied if we change the way we eat and change the way we view animals. Instead of viewing animals and other people as things to be used and only valuing them based on their utility, we should view them as having intrinsic value. They are valuable in their own right, regardless of how we may use them. If we acknowledge this, we must respect them and aim to never cause harm. Veganism is the answer to our problems. Can you imagine a world where people value other people and other creatures as equals? Where no one intentionally causes harm to another person or animal? Where no one lays waste to the environment for profits? Where we care about the health and happiness of each other more than the amount of money or material possessions we have? This is possible. And it all starts with you. I’m glad I took the step to go vegan years ago. I only wish I had taken that first step sooner.